I made a promise a while back that I was going to share a beer based candy recipe with you, and I figure its about time to follow through. 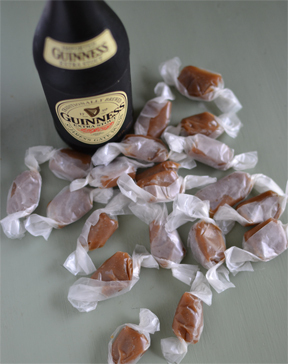 Jeth and I decided to give Guinness caramels a go during our candy making binge last month, since we think the molasses-y, coffee-y flavor of a good stout goes really well with things like brown sugar, cream, chocolate…you get the idea. I’m hoping it’s not just us who think Guinness and dessert are a perfect match – if we’re just crazy, I’m sorry to everyone who had to eat chocolate/Guinness/salted caramel cupcakes at our wedding (which, if you’re feeling jilted because I haven’t shared the recipe yet, don’t worry…it’s in the works). But back to caramels. These definitely aren’t a novel idea – just do a web search for beer caramels and you’ll see. But, this is my own original recipe, so it has to be shared. It’s about as basic as a beer caramel recipe gets – no crushed pretzels, condensed milk, or melted chocolate in sight. Just the goodness of heavy cream, sugar (some brown, because why not), and a little butter. And beer, of course. I will warn you, these are not caramels-with-a-hint-of-beer-to-accent-the-flavor. These are beer flavored caramels. If you want a little less of the yeasty, stout-y aftertaste, the recipe will work just fine with as little added beer as you want. I’ve tasted them with a little, and a lot, and I happen to think they’re delicious either way. Line an 8×8 pan with lightly buttered parchment paper. Place the cream in a medium-large saucepan and bring to a simmer. Add sugars, stout, and corn syrup and return to a low boil, stirring constantly, until the sugar is dissolved. Cook over medium heat until the mixture reaches 255 F. Remove the pan from the heat and stir in the butter and salt. Let the caramels sit overnight, or until firm. Cut the caramels into 1″ pieces and wrap them in squares of waxed paper. They will keep at room temperature or in the fridge for at least a week, but they’re best fresh. *Note: to flatten the beer, either pour it into a bowl and let it sit for at least an hour, or whisk it quickly until it stops fizzing to speed up the process. Tags: candy, gluten free, recipe, vegetarian. Bookmark the permalink.